What are the types of Ehlers-Danlos syndromes? How are Ehlers-Danlos syndromes diagnosed? Ehlers-Danlos syndromes are a group of disorders which share common features including easy bruising, joint hypermobility (loose joints), skin that stretches easily (skin hyperelasticity or laxity), and weakness of tissues. Ehlers-Danlos syndromes are inherited in the genes that are passed from parents to offspring. Ehlers-Danlos syndromes symptoms and signs are joints that are more flexible than normal and loose skin that stretches away from the body. The diagnosis of Ehlers-Danlos syndrome is based upon the clinical findings of the patient and the family history. Ehlers-Danlos syndromes are treated according to the particular manifestations present in a given individual. The Ehlers-Danlos syndromes are inherited in the genes that are passed from parents to offspring. They are categorized according to the form of genetic transmission into different types with many features differing between patients in any given type. The fragile skin and loose joints is often a result of abnormal genes that produce abnormal proteins that confer an inherited frailty of collagen (the normal protein "glue" of our tissues). In 2001, researchers discovered a new form of Ehlers-Danlos syndrome that is caused by an inherited abnormality in a protein other than collagen that also normally plays a role in binding together the cells of our tissues (including the skin, tendons, muscle, and blood vessels). Abnormalities in this protein, called tenascin, also lead to a form of Ehlers-Danlos syndrome. Researchers suspect that tenascin could play a role in regulating the normal distribution of collagen in the connective tissues of the body. Marked joint hypermobility, skin hyperextensibility (laxity), and fragility are characteristic of the classic type of Ehlers-Danlos syndrome. The smooth, velvety skin is fragile and tears or bruises easily with minor trauma. Joint dislocations and scoliosis are common. Joint instability can lead to sprains and strains. This classical type is inherited as an autosomal dominant genetic trait (directly passed on from one parent to child). Joint hypermobility is the major manifestation of this form of Ehlers-Danlos syndrome. Any joint can be affected, and dislocations are frequent. This type is also inherited as an autosomal dominant genetic trait. In this form of Ehlers-Danlos syndrome, spontaneous rupture of arteries and bowel is a serious manifestation that can lead to death. Clubfoot can be present at birth. Skin laxity is of varying degrees. Veins can be very visible through the skin. It is primarily inherited as an autosomal dominant (directly passed on from one parent to child) genetic trait, but recessive (not seen in family members or only in one generation of members of the same family, meaning that an individual must inherit two copies of the mutation, one from each parent) trait inheritance has been described. Fragile globe of the eyes, significant skin and joint laxity, and severe curvature of the spine (scoliosis) are typical features. Its inheritance pattern is autosomal recessive. Patients are short in height and severely affected by joint laxity and dislocations. Skin involvement is variable. Both autosomal dominant and recessive inheritance is possible. A skin biopsy can be used to diagnose this disorder. Patients have severely fragile skin that is soft and doughy with sagging and folding. This rare form of Ehlers-Danlos syndrome can be diagnosed with a skin biopsy. Joint hypermobility, hyperelastic skin, and fragile tissue are seen. Patients with this type lack the multiple shrinking (atrophied) scars in the skin that are often seen in classic Ehlers-Danlos. It is inherited as an autosomal recessive genetic trait. Other rare variant types have been reported in single families. Symptoms of Ehlers-Danlos syndromes include loose skin that stretches away from the body easily and excessively. The skin can appear saggy and soft and may tear easily and be fragile. Signs of Ehlers-Danlos syndromes include easy bruising without significant trauma and joints that can move beyond the normal range of motion. Joint hypermobility in Ehlers-Danlos syndromes can lead to multiple joint dislocations. The diagnosis of Ehlers-Danlos syndrome is based upon the clinical findings of the patient and the family history. For some types of Ehlers-Danlos syndrome, a skin biopsy to determine the chemical makeup of the connective tissue can help to suggest the diagnosis. Skin protection (from injury of trauma and sun, etc.) is critical. Wounds must be tended with great care and infections treated and prevented. Suturing can be difficult as the skin can be extremely fragile. Joint injury must be avoided. Occasionally, bracing may be necessary to maintain joint stability. Exercises that strengthen the muscles that support the joints can help to minimize joint injury. Contact sports and activities involving joint impact should be avoided. REFERENCE: UpToDate. Clinical manifestations and diagnosis of Ehlers-Danlos syndromes. How was your Ehlers-Danlos syndrome treated? How was your Ehlers-Danlos syndrome diagnosed? Do you or a relative have Ehlers-Danlos syndrome (hypermobility)? Please share your experience. What symptoms have you or someone you know experienced with Ehlers-Danlos syndrome? What lifestyle changes have you experienced that has helped symptoms of Ehlers-Danlos syndrome? Abdominal aortic aneurysm is a ballooning or widening of the main artery (the aorta) as it courses down through the abdomen. Most abdominal aortic aneurysms produce no symptoms. Treatment may include observation or surgical repair. Aortic dissection is a small tear in the large blood vessel that leads from the heart and supplies blood to the body. There are two types of aortic dissection, type 1 and type 2. Signs and symptoms of aortic dissection include a tearing or ripping pain, nausea, sweating, weakness, shortness of breath, sweating, or fainting. Treatment depends on the type of aortic dissection, and the severity of the tear in the aorta. 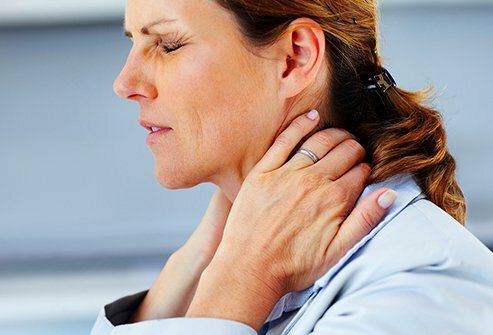 Connective tissue disease is when the body's connective tissues come under attack, possibly becoming injured by inflammation. Inherited connective tissue diseases include Marfan syndrome and Ehlers-Danlos syndrome. Systemic lupus erythematosus, rheumatoid arthritis, scleroderma, polymositis, and dermatomyositis are examples of connective tissue diseases that have no known cause. Symptoms and signs of a dislocated ankle include pain, swelling, bruising, ankle deformity, and possible numbness and tingling in the foot. Treatment of an ankle dislocation involves putting the ankle bones back in their normal positions, possible using gentle traction. The blood and nerve supply to the foot will be evaluated and the ankle will be checked for any related fractures. The ankle will be fitted with a splint or a cast. Emphysema is a COPD (chronic obstructive pulmonary disease) that often occurs with other obstructive pulmonary problems and chronic bronchitis. Causes of emphysema include chronic cigarette smoking, exposure to secondhand smoke, air pollution, and in the underdeveloped parts of the world. Symptoms of emphysema include chronic cough, chest discomfort, breathlessness, and wheezing. Treatments include medication and lifestyle changes. Flatfoot is a disorder in which the foot's entire sole is touching the ground while standing. Symptoms and signs of flatfoot include heel, ankle, knee, hip, and lower back pain and shin splints. Treatment depends upon the type of flatfoot, the symptoms, and the stage of the disorder. Hyperdontia is a condition in which a person has an excessive amount of teeth (more than 20 primary teeth or 32 permanent teeth). The cause is unknown. Treatment involves tooth removal. The joint hypermobility syndrome is a condition in which the joints easily move beyond the normal range expected for a particular joint. The condition tends to run in families. Symptoms of hypermobility syndrome include joint pain. People with hypermobility syndrome are more susceptible to injury, including dislocations and sprains. Anti-inflammatory drugs can help with joint pain. Exercise can strengthen muscles, providing stability. Learn about osteoporosis, a condition characterized by the loss of bone density, which leads to an increased risk of bone fracture. Unless one experiences a fracture, a person may have osteoporosis for decades without knowing it. Treatment for osteoporosis may involve medications that stop bone loss and increase bone strength and bone formation, as well as quitting smoking, regular exercise, cutting back on alcohol intake, and eating a calcium- and vitamin D-rich balanced diet. Pregnancy planning is an important step in preparation for starting or expanding a family. Planning for a pregnancy includes taking prenatal vitamins, eating healthy for you and your baby, disease prevention (for both parents and baby) to prevent birth defects and infections, avoiding certain medications that may be harmful to your baby, how much weight gain is healthy exercise safety and pregnancy, travel during pregnancy. Scoliosis causes an abnormal curvature of the spine. When the cause of scoliosis is unknown the disorder is described based on the age when the scoliosis develops (infantile, juvenile, or adolescent idiopathic scoliosis). In functional scoliosis, curvature develops due to a problem somewhere else in the body. With neuromuscular scoliosis, there is a problem when the bones of the spine are formed. Treatment typically involves observation, bracing, and surgery and is dependent upon the severity of the curvature.